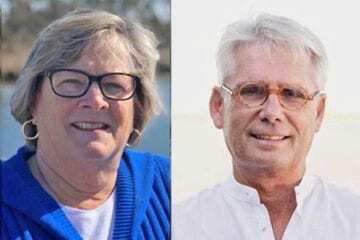 Ann Patera and Ervin Bateman are running for the seat. Early voting starts Wednesday, Oct. 16. Election Day is Nov. 6. We put together questions and answers complied from surveys by Vote411.com, the Outer Banks Association of Realtors and the Outer Banks Homebuilders Association. What motivated you to seek election to this office? Bateman: To give back to the community. I feel like I can make a difference and want to be part of the decision making process that will make Dare County the best it can be. time I visited here in the late 60s. We have been real property owners here since 1987, and planned for years for our retirement here. Having worked in both state and Federal government and for many candidates and elected officials, I know the importance of good government. When I became aware that there was to be a vacancy in the at large seat on the Board of Commissioners, I knew right away that it was the right opportunity for me to serve the citizens of Dare County. Good government requires the skill, time and attention of good citizens and I have the experience, skill and desire to serve. What is the most important issue Dare County Commissioners will have to address in the next two years? Bateman: Looking at the big picture, I would have to say protecting our billion dollar tourism industry. When you think about it, it feeds every job, every municipality, county government, education .. all the working parts that make Dare County what it is and we need to do everything we possibly can to preserve our tourism industry. Having said that, the threat of off-shore drilling could jeopardize it all with only one oil spill. Therefore, we as a community need to stand up and say NO to off-shore drilling and seismic testing. Petera: Offshore drilling and seismic testing. While I support the concept of American energy independence, there are much safer alternatives to achieving that goal. I am gratified that the current Board has made such a strong effort against drilling or testing off the NC coast, including meeting with our NC Congressional delegation in Washington and our leaders in Raleigh. I would work hard to continue that effort. Are there policies you believe can be enacted that would improve the economy of Dare County in the next two years? Bateman: We need to do everything we possibly can to protect our sport and commercial fishing, maintain open inlets and address our transportation needs, bridges, etc. We need to take a hard look at the flooding areas within our municipalities and incorporated Dare. We need to do studies to find out where the hot spots are and address them. Petera: Our economy in Dare County consists of three main segments: tourism, fishing and boat building. I support any and all policies that foster a positive environment in which these activities will flourish. Beach nourishment, promotion of the Outer Banks as an ideal destination for summer vacations, and strong support for both commercial and recreational fishing are key to maintaining the economy of Dare County. What is your opinion/vision of future development and redevelopment on the Outer Banks? and less large rental homes. I am in favor of the creation of a combination of PCD, PUD that would allow for residential rentals to address our need for affordable rentals as well as address economical need for commercial development. are many vacant and even blighted residential structures and commercial buildings throughout the Outer Banks. My vision is of a coordinated municipal and countywide effort to rethink and redefine land use plans with an eye toward the future. We need creative ideas on the development of multi-family dwellings to open up availability of housing at the entry level, both for seasonal workers and local residents just starting out on their own. What kinds of policies will you pursue to promote affordable housing in our county? Bateman: I am in favor of the creation of zones within municipalities and unincorporated Dare to allow as we have in Kitty Hawk, mother-in-law suites which would allow putting in a 600 sq. ft. dwelling behind an existing dwelling under the same setbacks as presently zoned. This is a back door way of allowing the creation of less costly homes and would supply housing and economic development for homeowners. I would also support zones that allow student housing for our students and summertime help. Petera: The available land mass Dare County is about 90% built out, exacerbating the problem of building more affordable housing. I would support reducing the minimum lot size for parcels that have access to public water and sewer and do not need to accommodate wells and septic systems nor be concerned with the proximity of those systems. I also support recent actions taken by Duck and Kitty Hawk to once again allow accessory dwelling units, or ADUs. What do you feel are the greatest infrastructure/capital improvement needs in the area? ways to relieve traffic bottlenecks going to Duck and Hatteras Island. Roanoke Island Campus for the College of the Albemarle. How would you rate Dare County’s public education system (poor, below average, average, above average, excellent), and what proposals would you support to improve it? Petera: Above average. The Dare County School system was ranked 23rd out of 116 public school systems in NC by Niche. While there may be other studies that rank our schools differently, I think this one is a good indicator. I have been impressed with the new School Superintendent as well as Dare’s excellent efforts to increase dual enrollment in college courses in our high schools. I will thoroughly review any proposals for improvements from the School Board and support those that I find to be the most valuable. How would your rate the access and quality of healthcare service in Dare County, and what can the Board of Commissioners do to improve healthcare services? Bateman: Access – Excellent. Quality – Average. We have come a long way since Dr. Harvey in Manteo and Dr. Wright in Currituck who served 70 miles of our county. We now have a hospital, cancer center, access to three fine hospitals: Norfolk Sentara, Chesapeake General & Vidant in Greenville by way of Dare Medflight. We also have excellent EMS, first responders and Urgent Care facilities in Nags Head & Kitty Hawk. We need to expand our mental health services for those with dual diagnosis, substance abuse issues and beds for detox and long-term centers. Petera: Access – Average. Quality – Above average. There is adequate access to good quality healthcare services and that has improved greatly over the past two decades; with the hospital providing a driving force, attracting several specialty service providers in recent years. We do continue to see some facilities decide to close and leave the area, which generally means either the competitive forces are at work or that there is simply not enough demand to support the number of service providers operating here. What is your stance on the permitting of offshore drilling and seismic testing along the N.C. coast? Bateman: I am adamantly against off-shore drilling and seismic testing but am for energy independence. Petera: I am opposed to permitting offshore drilling and seismic testing along the NC Coast. The risk of any kind of leak, spill or accident is simply too high. Even a small oil spill could negatively impact tourism for an entire season or longer, spelling financial disaster for our citizens and the entire economy. What do you feel can be done to give Dare and Currituck Counties, as well as other eastern N.C. counties a stronger voice when working on these issues? Bateman: Elect officials who are not afraid to make and return calls and lobby fellow representatives in Raleigh and Washington, DC for the things we need to move us forward. Not sure where Mr Bateman gets his info but average teacher pay in NC is over $50,000 a year. Is he uninformed or fake news? Average teacher salary in Dare County is $39,110 according to NC website. That seems closer to $37,000 as I see it. I believe his statement was average “starting” pay for entry teachers. Maybe you’re the one who is uninformed because you don’t read or read for you’re own “facts”! I said years ago I would never vote for a democratic candidate, unless they have proved themselves, through actions not words. I have known Ervin for a long time, and I believe he has paid his dues, and proved himself to be honest, fair, and open minded. I will break my vow and cast my ballot for him. Hey Honcho! I think that teachers salaries are capped at about $50,000/yr, You must be getting your “news” from Alex Jones or some other brilliant outlet. Maybe try using this thing called Google. Its really great. You can find out all kinds of stuff if you actually want to find out some facts. Bateman said $35k. Google for dare county says $39110 . According to the news and observer article NC average, teacher pay is $50,861.That’s from Google and the news and observer “dave”. The candidate for office should be the one finding out the facts instead of putting forth misinformation. The rest of the county and state workers in this state have been the red headed step children for years as the teachers were given raises. I would like to see him care about all government workers, not just a select group. And shows the starting salary for a teacher with no experience and a bachelor’s degree is $35k. However, that being a state figure, I am sure that number varies based on a variety of factors from county to county. With a google search telling me that the average pay for Dare County teachers is low $40k, I’d guess that starting salaries for some are actually below that $35k number, unfortunately. And, the salary for “entry teachers” (what Bateman references) would not be the same as the “average” salary. The starting pay $# is not misleading at all; maybe it’s your interpretation/comprehension of his answer that’s leading you astray. Bateman gets my vote. Practical guy who has common sense and knows the history of the Outer Banks. Petera’s all about party before the people; also, as a Washington DC insider, it’s time to drain the swamp! The NC salary schedules listed at ncpublicschools.org clearly supports Mr. Bateman’s statement. The starting salary for a teacher with 0 years experience is $35000 annually. I believe your figure must include the county supplement which varies depending on the county of employment. As a former teacher, I strongly agree with Mr. Bateman and find his statement. It is clear that Mr. Bateman knows his facts and is not putting forth “misinformation” as you accused. I believe the issue is that you are confused and do not understand “starting salary” or as Mr. Bateman refers to as “entry teachers”. You seem to be focused on “average pay” which is entirely different. Mr Bateman did mention the “average cost of rent” for teachers in our county. Perhaps that is where you became confused. It would be nice for you to check YOUR facts or at least ensure you are comprehending what is actually being stated before criticizing any candidate running for office. I assure you that Mr. Bateman cares about ALL groups in our county, including our citizens in government, as well as, non-government. I believe he will be the voice for all our citizens and not just the “select group” you referenced as “all government workers”. He gets my vote!